Gabby & Tri were one of our October 2017 couples (and possibly two of the sweetest people you could ever meet). 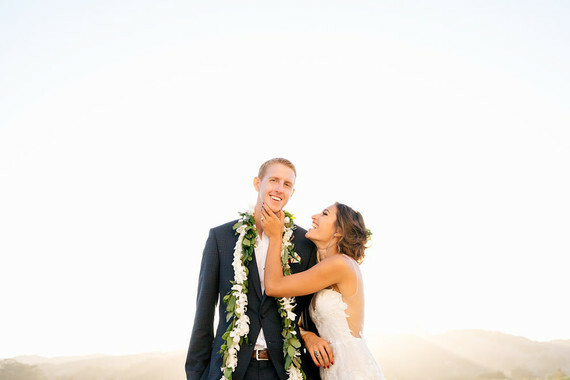 Tri's family came from beautiful Hawaii, so a little tropical flare was a must throughout their wedding weekend. That wasn't the only noticeable piece of their wedding, though. 100 Layer Cake also noticed the perfectly executed rustic modern mix that defined their big day. More STUNNING photos can be seen here on the 100 Layer Cake Feature. The Weekend | While Gabby & Tri's wedding day was undoubtedly spectacular, our Greengate team had the joy of witnessing the whole weekend, and let us tell you - they did things right! This crew stayed with us from Wednesday to Sunday, using the first couple days to settle in, relax, and enjoy surrounding San Luis Obispo. Following Friday's rehearsal, they held Rehearsal Dinner at the Ranch House with family and friends. Saturday morning, Tri put on his tuxedo print wetsuit and took his guys out to surf in nearby Pismo Beach, while Gabby and her girls got ready in the house. Sunday morning, guests enjoyed an onsite poolside brunch from local Sally Loo's Wholesome Cafe before calling an end to the weekend fun. A big thanks to 100 Layer Cake for letting us relive the love of Gabby and Tri's wedding weekend and congratulations to Gabby & Tri!